Electric motor systems are estimated to consume more than half of all electricity used in America, and more than 70% in many industrial plants. The annual energy cost to run a motor can exceed the initial purchase cost by six times or more! OPU offers rebates for purchases of premium-efficiency motors of 1 to 200 horsepower. Higher horsepower motors may be eligible for rebates under our custom efficiency rebate program. 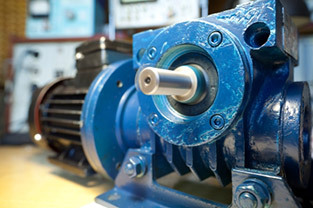 Processes in your commercial and industrial facilities require varying motor speeds, but many motors run constantly at full tilt — resulting in wasted energy, inaccurate control, and shortened equipment life. Variable Speed Drives (VSD) adjust motor speed to vary the amount of power delivered to your fan or pump, according to the work required, thereby using only the amount of energy needed. OPU offers rebates for purchases of VSDs of 1 to 200 horsepower installed on fans or pumps. Other equipment installations may be eligible for rebates under the custom efficiency rebate program. The Interactive Motor Rebate Application is in an Excel format and fills in the codes and rebate amounts when a user selects the applicable equipment from a pull-down menu. It also provides a financial investment analysis and can be downloaded here.